This painting is another charming example of the work of the English artist Charles Burton Barber (1845-1894). Barber is most well-known for his subject paintings of children and their pets. This oil on canvas was completed in 1891 and measures 71.8cm by 92.1cm. 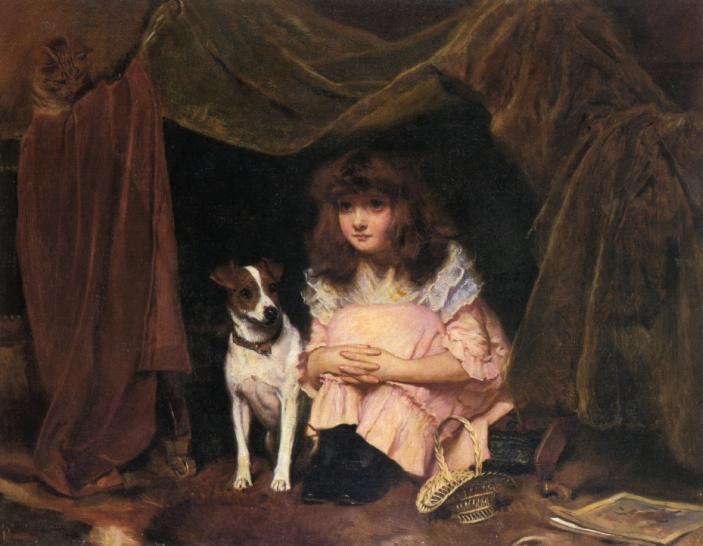 The Hiding Place depicts a young girl hiding under a tent of her own making. Rich yardage of velvet draped over several pieces of furniture provide the girl and her dog a place to hide. She is weaning a pink dress with a white, ruffled lace collar and black shoes. We see scattered around her several things she has secreted away in her tent, including what looks like a picture book. Unbeknownst to the pair under the tent, a small kitten is climbing upon the roof of the tent and watching the little girl and dog. Has the kitten found a soft hiding place of her own, or is she preparing to pounce on the unsuspecting pair beneath her. Like so many of Barber’s paintings, there are fine details that would seem a bit unsuspected if you consider the artist much preferred painting the animals and cared little for the remainder of these subject paintings. Here we have the small wheels that commonly appeared on the bottom of Victorian-era furniture as well as the inclusion of a highly detailed wicker basket. Please visit our biography of the artist to learn more about Charles Burton Barber and see more of his famous paintings.